South of N.H. Route 12A, one and one-half miles southwest of Plainfield Village on Mill Road in "Squag City" in Cornish. The bridge spans a deep gorge on the Blow-Me-Down Brook. The bridge is 85'9" long with a clear span of 74'6". It has an overall width of 16'4" with a roadway width of 13'8" and a maximum vertical clearance of 9'11". A cross beam (tell-tale) set at a height of 7'0" has been installed at each approach to block high vehicles. The bridge is posted for six tons. The bridge was build by James Tasker. The structure was repaired by Milton Graton and his son Arnold in 1980. The restoration was made possible with the aid from a federal Historic Preservation Fund matching grant from the National Park Service of the U.S. Department of the Interior through the New Hampshire Division of Historical Resources, the Town of Cornish, the Cornish Historical Society, and private contributions. 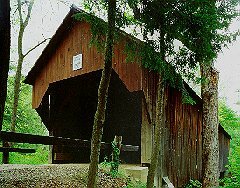 The Blow-Me-Down Bridge is listed on the National Register of Historic Places.